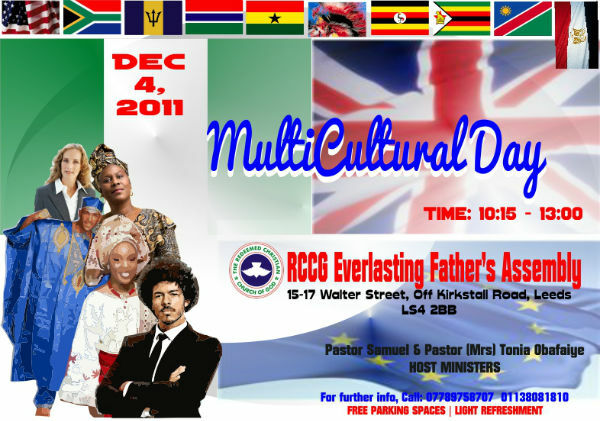 The RCCG EFA Leeds Multicultural Day. ‎...After this I beheld, and, lo, a great multitude, which no man could number of all nations, and kindred, and people, and tongues stood before the throne, and before the Lamb...(Rev. 7:9). The 4th of December 2011, the nations and tongues in our midst will stand before God to shout salvation to our God for ever and ever! Be there to represent your nation. An opportunity to learn about cultures from other parts of the world. Dances, poetry, songs, and many cultural interactions. SUNDAY 11 DECEMBER: CHRISTMAS CAROL. Copyright © 2011 RCCG Everlasting Father's Assembly, Leeds, All rights reserved.